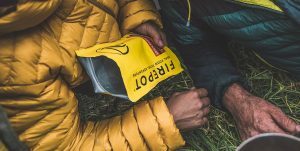 AMG Group, one of the UK’s leading outdoor companies, have agreed a new UK distribution partnership with award winning expedition food manufacturer, Firepot. Firepot has been five years in the making. As adventurists trekking through Greenland, the founders identified a hole in the expedition food market. They wanted healthy, hearty meals that didn’t weigh them down or keep them waiting. Above all, they wanted natural food that tasted as good as the food they ate at home. They couldn’t find it anywhere. Consequently, Firepot was born in a Dorset barn — delicious, nutritious, dehydrated slow-cooked meals inspired by their travels. They’ve kept it lightweight and easy to use so it can be enjoyed from the heights of the Himalayas to the fjords of Chile. All you do is add water. The Firepot menu collection is defined by the honest provenance of its ingredients. You won’t find any artificial additives, flavourings or preservatives. Nor do they use palm oil. The founders are obsessed by quality suppliers. Their recipes — and their unique dehydration technology — ensures the protein, carbohydrate and fibre levels are high whilst keeping saturated fat and salt intake to a minimum. Not only does the food taste good, but it’s exactly what you need to fuel any adventure. 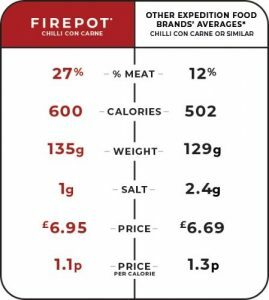 See Firepot’s Chilli con Carne comparison (below). ‘We are delighted to sign a new partnership with AMG Group, helping us bring our award winning Firepot menu to a wider audience. We are also excited to be positioned alongside established and highly regarded brands, such as Vango. Since 1966, AMG Group has a long heritage developing, designing and distributing cutting edge outdoor equipment, including pioneering new tents, rucksacks, awnings, furniture, camping accessories, ski equipment and footwear. Headquartered in Port Glasgow, AMG Group products are now available in over 30 countries. Developed over the last five years, Firepot has won numerous awards including 2018 Taste of the West double silver award, and 2018 Best New Brand in the Outdoor Excellence Awards.